Sailhamer, John H. Introduction to Old Testament Theology: A Canonical Approach. Grand Rapids, MI: Zondervan, 1995, pp. 327, $21.99, paperback. John H. Sailhamer (1946-2017) taught Old Testament at Biola University, Bethel Seminary, Trinity Evangelical Divinity School, Western Seminary, Southeastern Baptist Theological Seminary, and Golden Gate Baptist Seminary. In 2000, he was elected president of the Evangelical Theological Society, and made major contributions to Evangelical Old Testament scholarship through his writing. Sailhamer recently passed away and a review of one of his significant contributions is merited as it has retained its value for over 20 years. He published over fifteen books, many articles and contributions to edited volumes, and left a legacy for appreciating the Old Testament that can inspire and continue to guide Biblical Studies students today. 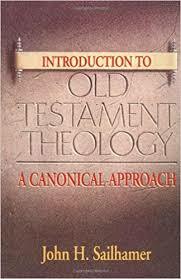 Sailhamer’s classic work, Introduction to Old Testament Theology: A Canonical Approach, is designed to provide a “student-oriented, comprehensive overview of the discipline” (p. 5). Additionally, Sailhamer sought to offer a fresh contribution to Evangelical Old Testament scholarship through his own canonical approach. His book has three parts: an introduction, historical and methodological overview, and a concluding section containing Sailhamer’s own methodological proposal for a biblical theology of the Old Testament. The appendices after his concluding chapter provide short examples of his canonical approach. In part one, Sailhamer examines what is meant by the words Old Testament Theology, which he defines as “the study and presentation of what is revealed in the Old Testament” (p. 17). The Old Testament scholar’s task involves hermeneutics, language, translation, exegesis, and introductory questions (date, author, genre, form) as well as articulating the dynamic relationship of the Old to New Testament (making this a distinctly Christian enterprise), the Old Testament within the context of the Ancient Near East, and then presenting the conclusion of this process in a specific format. Part two (The Methodology of the Old Testament) is the largest portion of Sailhamer’s book. In chapter two, he proposes a linguistic, taxonomical approach (componential analysis) in order to evaluate the assumptions that drive the different Old Testament theologies. His binary (+/-) approach evaluates four general components that comprise scholars working assumptions: text or event, criticism or canon, descriptive or confessional, and diachronic or synchronic. These binary components are the subject of the four subsequent chapters. Chapter three (Text or Event) considers whether an OT theology focuses on the Hebrew text or the historical events behind the text. Responding to the historical criticism of Modern critical scholarship, conservative (Evangelical) scholars have reacted by retaining the historical methodology of Modern biblical criticism to demonstrate the meaningfulness and reliability of the Old Testament. Sailhamer’s proposed corrective is for Evangelicals to take seriously their own claim that revelation is tied to the written Word of God, with the result that claims to verbal inspiration should lead one to adopt a text-oriented approach to the meaning of the Old Testament rather than an event-oriented method, however useful for apologetic purposes. Chapter four (Criticism or Canon) examines approaches to OT theology that either focus on the reconstruction of previous forms of the text or those that focus on the final form. These approaches can be further sub-divided by the previous question concerning text- or event-oriented assumptions to help the student situate the major critical sub-fields of biblical studies, including literary, source, form, tradition, phenomenological, canon, composition, redaction, text-linguistic, and historical criticism. In chapter five (Descriptive or Confessional), Sailhamer considers methods which exclusively utilize scientific methodology so as to more objectively describe the theology of the Old Testament, and those which retain faith commitment intentionally. After a lengthy overview in which he attempts “to take all the current and past versions of the origin of biblical and OT theology into account” (p. 117), he concludes by contending that even confessional approaches must attempt to be as descriptive as possible in order to consider the meaning of the Old Testament to the original audience. Finally, in chapter six (Diachronic or Synchronic), he examines the diachronic or synchronic approaches by which OT scholars choose to present their Old Testament theologies. Diachronic approaches are generally temporally ordered, but some are structured by logical connections while others are constructed by thematic connections built on a temporal sequence. Synchronic approaches, on the other hand, are organized by major topics or central ideas, and include synchronic-systematic, synchronic -synthetic, and synchronic-scriptural presentations. Although ultimately proposing a diachronic model, Sailhamer is sympathetic to other modes of Old Testament theological presentation and concedes their validity based on their usefulness in their specific context. Part Three contains Sailhamer’s proposal for his canonical theology of the Old Testament. In this chapter, he shows how his four basic assumptions (text, canon, confessional, and diachronic) shape his specific approach. Sailhamer contends for a text-oriented approach because his view of Scripture as divine revelation in verbal inspiration leads him to find the meaning of the Old Testament in the history of God’s acts with his people as represented in the Hebrew text, not in a reconstruction of the factual, historical events. Thus, he proposes a text-theory that takes seriously philology, in-textuality, inner-textuality, inter-textuality, con-textuality, narratology, and compositional strategy. As Sailhamer locates divine revelation in the final form, he finds value in tradition and text-criticism only in so far as they contribute towards helping understand the meaning of the final form of the canon. His confessional approach appreciates the apologetic usefulness of historical method for demonstrating the general truthfulness of the Old Testament, but does not utilize it for understanding the meaning of the final text. Finally, he proposes a diachronic approach that follows the structure of the Hebrew Bible (Law, Prophets, and Writings) because the nature of the Hebrew Bible lends towards a diachronic approach due to inter-textuality, canonical redaction, and con-textuality. After his concluding proposal, Sailhamer includes four appendices that illustrate his approach. Appendix A evaluates the major themes and purpose of the Law in the Pentateuch. Appendix B applies compositional critical methodology to the Pentateuch in order to highlight the specific compositional strategies at work. Appendix C is a consideration of literary techniques in the narrative world of Genesis, while Appendix D is an exegetical investigation of the inter-biblical interpretation in 1 Chronicles 21:1. Sailhamer’s Introduction to Old Testament Theology still maintains significant value for the student in three ways. First, Sailhamer’s taxonomical analysis of the assumptions driving different methods for Old Testament theologies will help every student, pastor, and even scholar quickly and insightfully situate Old Testament theologies by their assumptions. Second, his categorical distinctions will help the student in developing their own method for studying and presenting the theology of the Old Testament. The historical and methodological overview will help students to assess their own assumptions and intentionally choose their own approach. Finally, Sailhamer’s own canonical approach offers a method that takes seriously divine revelation and yet does not become overly fixated with attempting to prove the historicity of the narratives. Rather, separating methodologically from the historical method, the text-oriented, canonical approach offers a confessional student of the Old Testament a diachronic method which takes the historical facticity of the text for granted, and focuses on compositional strategies in order to exegete the meaning of the Old Testament for the church today. Sailhamer’s introduction belongs on the bookshelf of every biblical studies student, pastor, and Old Testament scholar.